Layla Kate got her hair cut on Sunday. She was such a good girl! She sat very still while Ms. Magan cut her hair. We love Ms. Magan! so Auntie was here to witness the fun time. Ms. Magan trimmed up Auntie and Mommy's hair too! Looks much better, but now we aren't sure if we can get it into pig-tails for our Halloween cheerleader costume....we shall see! 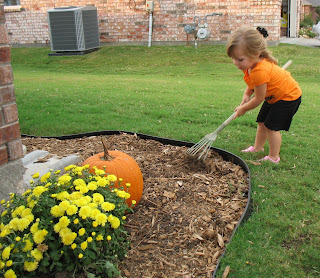 We made a trip to the Flower Mound Pumpkin Patch on Tuesday. Gary and I took so many pictures. It was so hard to pick just a few. A little help from Daddy! Layla ran out of smiles....she was so sick of posing for pics! Our trip to the pumpkin patch was so fun. Gary & I were surprised at how much fun it was! We can't wait to go back next year!! 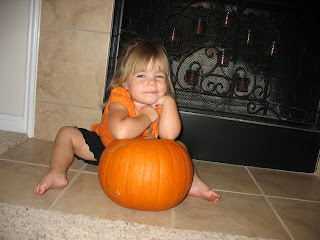 Layla loved this pumpkin with the bumps all over it. Head on the floor, and push off.... And TahDah....a not so graceful landing, but oh well! She tried again, and again, and.....now she will never go to bed, she's wired!! 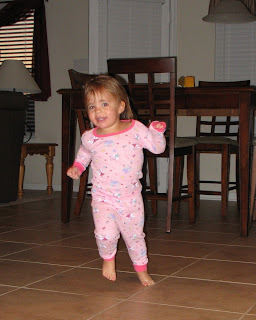 Thank you Neese & DeDe for the cool pajamas....obviously she loves them! 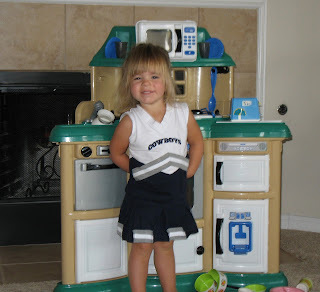 Gary spent his Sunday afternoon putting together Layla's new kitchen...Super cool! It is fully equipped with a fridge, oven, dishwasher, microwave and sink! It came with tons of little dishes, and I dug around in the attic for my childhood cookware. I am really excited about our little Layla Ray. 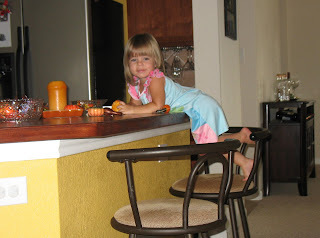 She is always bringing her step stool into the kitchen watching me cook. Hopefully she will be cooking up some yummy dishes soon!! Thanks for putting it together daddy! Pausing to pick up a cricket. One of Layla's favorite activities is playing with the parachute. We all hold the handles and walk in a circle....the kids go underneath it, and even ride on top! Big fun! Layla loves playing with the bouncy balls...she is sitting on one! 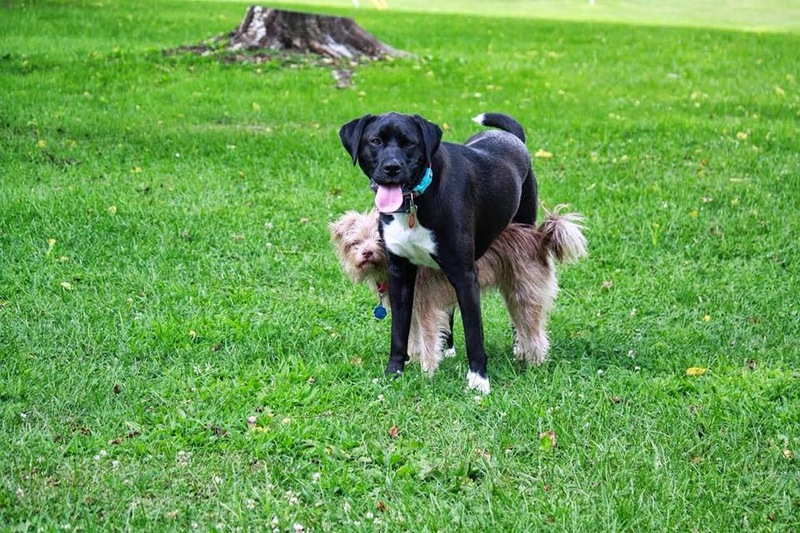 This is a silly picture...someones hiney and lots of blur. I just had to post a picture of her hanging around!! Auntie Carol & Layla feeding Tom and Jerry yummy bread. During a visit to Uncle Barry and Aunt Diana's this past weekend, we met their donkey neighbors! We had so much fun feeding them half a loaf of bread. Tom and Jerry were so sweet and cute. Helping mom plant mums in the yard. Taking a 4 wheeler break. 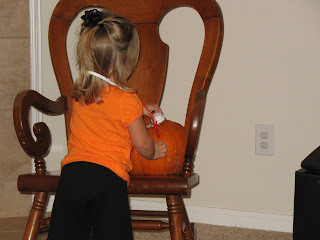 Layla decided to check the pumpkins heart-beat with her new stethoscope.